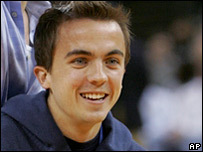 Malcolm in the Middle star Frankie Muniz is taking a break from acting to pursue a career as a professional race car driver. The 20-year-old actor, who has played child genius Malcolm for seven years, said he intends to return to acting in a couple of years - as an adult star. "I really love racing and this is what I want to do right now and for the next two years," said Muniz. Malcolm in the Middle comes to an end in the US in May after seven series. The award-winning sitcom, about a dysfunctional family and their brilliant middle son, was axed in January by Fox TV because of falling ratings. "I've had Malcolm since I was 12," said Muniz, who has been acting since the age of eight. "I want to want to act and, right now, I want to race," he said. "You can't really juggle both because, if you do, you just don't get enough time in the car." "Truthfully, I think it will be easier for me to leave for a while and come back [to acting] when I'm 23, 24 and be an adult and start fresh." The actor first became interested in racing when he was invited to take part in a pro-celebrity race in California in 2004.